ST. JOSEPH, Mo. 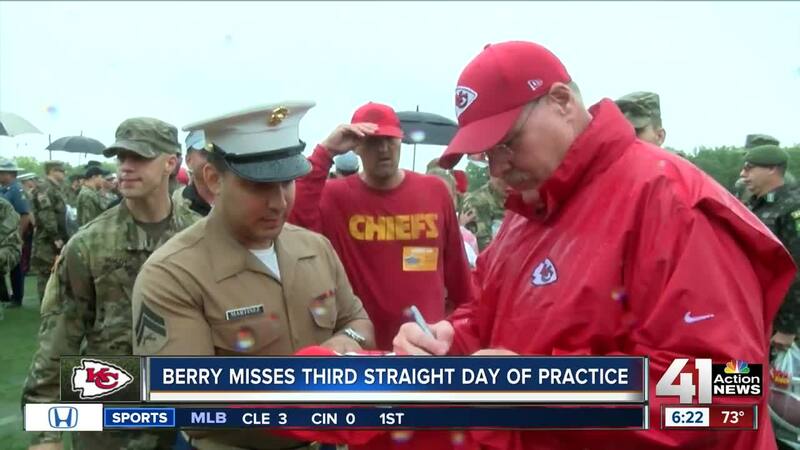 — The Kansas City Chiefs held their final practice at Missouri Western State University in St. Joseph Tuesday mostly in the pouring rain. While the team still has work to do as they get closer to the start of the season, Head Coach Andy Reid is happy to be headed back to Kansas City. "It's a little bit like being a farmer. Like, the work's never done," Coach Reid said. "We still have a lot of work to do. But, I appreciate the effort. And, the things that we did get done, the improvement of the young guys here. Missouri Western State University, I appreciate them and the way they treat us. They give us an opportunity to get out here and be able to focus in on playing." The final day was also Military Appreciation Day. Various members of the military, along with Gov. Mike Parson, were present to greet the players, shake hands and take pictures. "[It was] great to have the military out here today. I wished we could've had a better day [with the rain]. But, they made it good," Coach Reid said. "They made the rain shine today. So, it was great having them here. They bring a great spirit with them. I love seeing our players with them. And, our players love intermingling and talking with them." Chiefs starting quarterback Patrick Mahomes was happy to see and interact with members of the military. "As NFL players, we've always supported the military. I mean, that's something that's never changed. It's something that we've always supported those people and everything that they've sacrificed for us," Mahomes said. "To have them out here is always great to show the support that they show for us as well, I mean, it's something that you really appreciate everything they do." A noticeable absence from practice was safety Eric Berry who's suffering from a sore right heel. That's held him out of practice for a third straight day. It's pretty evident that the Chiefs are being extra conservative dealing with Berry in light of the fact that he's returning from a season-ending ruptured left Achilles tendon last season. "Listen, we're being cautious with it and trying to be smart. Eric's been playing a long time. And so, he's doing a great job of communicating to us, you know, how he feels," Reid said. "We'll just keep easing him in and see where we're at with that." The next challenge for the team is improving their play on the field, in their second preseason game, against the Atlanta Falcons on Friday. In their last game against the Houston Texans, the first team only played nine snaps. They'll get an entire half of action against the Falcons. "You get to go out there, have a little bit more time, and hopefully get into a rhythm and get some scoring drives," Mahomes said. "[That's] something we didn't have last week with the first team offense or any scores. So, you wanna go out there [and] score. At the same time, you wanna make sure, like I said, all game, you're efficient. Get in and out of the huddle. You make the right checks at the line. You get the right protection calls. And, hopefully just have positive gains.